BACKTOFRANKBLACK.COM: Free podcast! Millennium Group Sessions X(-Files)Over! Free podcast! Millennium Group Sessions X(-Files)Over! In this special episode of the Millennium Group Sessions series, Troy and Jim speak to the spearheads of Xfilesnews.com and XF3 Army, Avi Quijada and Tiffany Devol. They discuss the controversial X-Files episode, "Millennium", look at the differences with fandom, and just have a long chat about the two shows. A lot of fun and a great way for fans of both franchises to come together! 16 Responses to "Free podcast! Millennium Group Sessions X(-Files)Over!" Great podcast. Give yourselves a small pat on the back or shoulder. James, funny guy! (like George said to Jerry in on Seinfeld episode, the backwards one). Thanks for mentioning my comment, I will cherish and take that with my to my grave, complete with a phone ring. I think Troy and James took some pointers from them smart gals, regarding the campaign. Don't be dark and do trust everyone. Life is easier that way...or is it? "in a circle of flowers and love"
Thanks for your rather spirited reading of my question in the podcast, James. Whoa! Alex: Glad you liked it - I like to have fun, so I hope you don't mind me being a little cheeky with comments from time to time! Josef - thanks and yes, myself and Troy were talking about some ideas based on what Avi and Tiffany said. Traum - but of course! Always flowers. Always love! Interesting... I have to say "The Kiss" didn't really stick in my mind. I suppose I was just being too perplexed by Frank not being at all surprised to be facing down "Zombie" horsemen of the apocalypse. I did watch that X-Files/Millennium episode today. It's been a few months, since I did last see it. And to be fair, it's actually a good episode, X-Files wise. More engaging than some of the stuff in Season 1 (which I thought was a bore after I had watched the boxset, and only watched X-Files occasionally). So I'm not a X-Files fan, but I don't hate it. Now when I look at the episode, I don't see it being all that weird, besides the zombies. It's never said it's what the Millennium Group wanted, these 4 MG members committed suicide and wanted to be raised to death. They believed in this other thing, and not necessarily what everyone in MG believed in, just look at the Owls and Rooster factions. And since some of them might have gotten a bit nutty, a la Lara Means, it's fair to say that these guys might have been a bit delusional and still managed to huddle together and make this happen. The only thing that bothered me, is that Frank Black knew this all along. He knew that Johnston character, the Necromancer, and he likewise knew him. He withheld that information to Mulder and Scully. So this does kind of reinforce the MG is involved much more as a whole. But we don't really know, as the group allegedly imploded or gone underground. And yep, Mulder knew the mystical symbol and they both knew of the MG. So, I guess they just kept the tattoo thing to themselves, not to embarrass Scully :D Skinner probably had a laugh after they left the office with the other agents that sat with them previously. The zombies were scary, but the really didn't do them justice in the basement scene. That just was silly, no excitement whatsoever. Why did they have to waste so many bullets on the zombies, it takes only one bullet in the head, and they didn't move too fast. And the fact that Mulder didn't know where they were, just that they were hiding. How big is this basement, it certainly didn't look that big and grand. Anyway, those are my findings after viewing the episode. Be dark and trust no one! Also, the XF MillenniuM episode was written by Frank, who was a bit out of the loop story-wise for the last two seasons of MM, and Vince Gilligan, who had never touched on MM. Weird choice. James, you have to do a Wire podcast soon! I'll drop by and do the Omar whistle! I guess I will just include myself in the circle of love and flowers, love everything, loved X-Files, loved Millennium and hell even loved The Lone Gunmen! I listened to this podcast twice. I am a fan of both Millennium and X-files, even tho my preference is definitely Millennium. I enjoyed X-Files with my older children. I don't feel that the "kiss" took anything away from Frank or Jordan. It was anticipated and somewhat of a let down. The Millennium episode was just another typical X-Files episode that just happened to center around Millennium. Was it meant to provide any type of closure? If it was, it did not succeed with me. It did the extreme opposite...it left me wanting more. Henceforth, my interest in Back to Frank Black and all things Millenium, Frank Black or Lance Henriksen. Does Frank ever get custody of Jordan or do Catherines' parents succeed at taking her from him? X-Files goes beyond Millennium into a different realm. Millennium takes the probable and makes it possible, no matter how strange or odd it is. Even in this day and age, Millennium is still top notch and incredible. Besides, if anything ever went wrong in Millennium, they could always blame the Group. The X-Files went to the top and then crossed over into the beyond belief aspect. I was always amazed, sometimes confused and sometimes just down right annoyed by what happened. But I was always awed by both shows. Thanks so much to Avi and Tiffany for sharing this pocast with us. Thanks to Josef for a great comment and to the emphasis on the reading of it. Hope your hand gets better soon. Once again, thanks to Troy, James and all the staff at BTFB for such a great connection. I really appreciate all you guys do for us fans. Mark, Haven't heard from you in awhile, are you still with us??? Just curious. Hope you are well. I'm fine now, Rhonda. Thanks for your concern. It was bothering me yesterday and especially on the night I fell and hurt my hand. Add me to the mix. I was a fan of the Lone Gunmen during the original and (sadly) short-lived run... Then, EK bought me the DVD boxed set for Christmas a couple of years back. Listened to the podcast in two parts. Am currently trying to catch up on Spooktalkular's podcasts. This XFilesnews podcast was a good one and git more interesting towards the end but it was not one of my favourites. I bought I Want to Believe on DVD but have had problems with it. There always seems to be a problem with Twentieth Century Fox DVDs, audio-wise. The DVD extras play fine but the film does not. And I went and bought the only version on Region 2 with the good list of extras. This has tarnished my opinion of XF2 on DVD. I would like to say I am not a jealous Millennium fan. This is always something people say when you don't like something ("oh you're just jealous"). It's the only thing they can come up with. 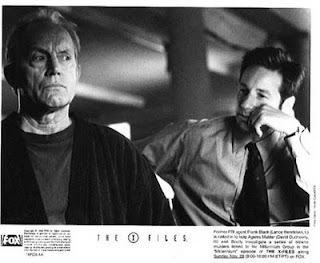 I am pleased about the possibilities for a third X Files film, but I am at the moment more interested in seeing a Millennium film in my local multiplex cinema (same with a film version of Arrested Development, "24", and especially all three currently running Law & Order shows). Wave - I think it's good you've brought up the point. Millennium fans being jealous of X-Files success doesn't do the Millennium fans any justice. It was a vast generalisation which I'm glad to see fans refute. I don't doubt there is some jealous for the X-Files success (I for one admit being slightly jealous), but yeah, fans of Millennium who don't like the X-Files that much aren't all jealous - there is no reason why one has to enjoy both to the same degree! Thanks so much for catching up on our podcast, we really do appreceate it! :) and also thanks for posting on our forums too. Haven't had a chance to reply but will do so!